Historically, the United States saw itself as embodying the best system of government with a foreign policy goal of bringing this system to the rest of the world. While Washington has, at times, dealt more realistically with other great powers at odds with this view, it has also attempted to alienate lesser states who reject the American system. The policies of non-recognition of China, Cuba and Iran were marked instances of this phenomenon. As the Obama administration renewed ties with Cuba and contemplated a more cooperative relationship with Iran, staunch opposition arose in defence of maintaining the long-standing policy of disengagement with these regimes. 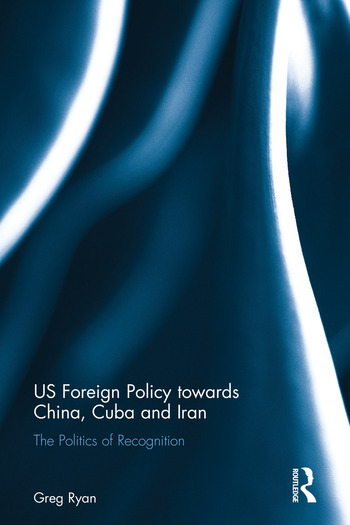 Providing a timely explanation for the origins of and continued support for US policies of non-recognition toward China, Cuba and Iran, this book demonstrates the links between IR theory and US foreign policy through the lens of the English School concept of International Society. It identifies historic costs stemming from US policies of non-recognition, and cautions that maintaining an overly narrow frame for understanding global politics will cause greater difficulties for US foreign policy in the future. This book will be useful for American researchers, graduate students and upper-level undergraduates in IR and American Foreign Policy. The inclusion of English School concepts and contrasting of IR theory inside and outside the US should also make it appealing to students in the UK and Australia. Greg Ryan has significant experience in cross-cultural relations from both academic and practical perspectives. In addition to teaching university courses in comparative politics in both the United States and China, Dr. Ryan served as a US naval intelligence officer from 2003 to 2008. His interaction with international students and foreign intelligence officers gives him an informed perspective on cultural barriers that inhibit US comprehension of world politics and problematic polices that stem from this deficient understanding. His most recent publication is ‘Regional Security Complex Theory, East Asia and US Re-balancing’ in Review of Global Politics, a policy journal in Taiwan.